Many times clients don’t know what they really want. What they think they want, may not be the right thing for them. These statements are somewhat puzzling. Let me explain. Let us first talk in terms of events that have happened. When mobile telephony was introduced, it was thought that there will not be any market for that. It was thought that there will be a tiny market for it predominantly among truck drivers, who constantly keep travelling. Today, India alone has about one billion mobile connections! Apple launched the Iphone in 2007. Then, we had phones which were covered with buttons. Phone makers were falling over themselves to launch phones that had more fuctionality and for that they were bringing in more buttons, front & back. Iphone was launched with just one button & a touch screen. It evoked a lot of curiosity & the market for such phones exploded. The customer did not know that such phones were good for them. The interface and the user experience was superlative. The product itself was well engineered ( like all other Apple products ). Manufacturers then did not know that the customer would accept a phone sans buttons. They made functional products which were often clunky. I have wondered a lot of times how some of the Nokia phones of the day, ever got into mass manufacturing! Steve Jobs was able to anticipate what the customer may be expecting before they even know! His products were sublime pieces of engineering… they were almost works of art. He delivered a user experience that the customers did not know was even possible. That was his genius. He used the same philosophy while launching Ipod, Ipad, Macbook etc. In our industry too, we can benefit greatly by taking a leaf off what Steve Jobs did. But, how many of us are anticipating what the clients may need & deliver that even before the clients ask for it? The routine stuff of performance reports, portfolio reviews, once in a while client meetings etc. are done by most of us. The customer is also largely accustomed to this and is not expecting anything over this – atleast for the moment. Therein lies the opportunity. There have been lots of changes in the lives of the client – the technology & social environment has changed significantly over time. The expectations from life themselves has undergone a sea change. For instance, today, there is a premium on experiencing things rather than buying & accumulating stuff. That’s precisely why travel, adventure sports, gourmet restaurants etc. are doing well. People are willing to spend serious money in these areas. The other area which has gained traction is physical & mental well being. We see more people focused on living healthy lives. People have taken to exercises/ gymming, running, aerobics, dance, martial arts, lean food etc. to stay in good shape. Hence, we see a lot of Gyms, dance studios, martial arts teaching centres etc., these days. Life has become far more complicated. We have huge amount of stress and tension in our lives. In view of the stressful lives we are leading, we are searching for ways to calm down the jangling nerves. Yoga, meditation, detox & destress courses, ayurveda therapies for rejuvenation etc. have become mainstream. We don’t have time. Life has become easy and tough at the same time. It is easy because we can accomplish a lot of things with just our computers and mobile phones. We can book tickets, pay bills, pay taxes, order stuff etc. without as much as moving a single step. But the options and choices have exploded. That information overload is leading to decision paralysis, as even the thought of analysing all the information and taking a decision is daunting. Financial area has become extremely complicated. That is exactly where we come in. We need to recognise the magnitude of changes that have happened in our client’s lives. As advisors, we need to come up with offerings to fulfil what the clients may require today. What is easy today is the transactional aspect. Even our clients can buy or sell using a platform. All manner of reports are available on tap. What is tough is the way finances themselves need to be managed. In their complicated lives, where they are already overwhelmed, they will welcome the idea of someone helping them with their finances. Clients of course have limited expectations – for they don’t know what to expect! They are just looking for the basics – someone who can tell them where to invest the money, help in monitoring their investments, a chat once in a while & some reports which will keep them informed as to where they stand. These are precisely what most financial intermediaries do. But, the client’s unstated requirements are much more than just these. Ideally clients would need all these – they need someone to comprehensively examine their situation, analyse their investments, understand their goals & needs, assess the risks they are exposed to, come up with a suitable asset mix based on their specific needs and risk bearing capacity & then suggest all that they need to do. This is Financial Planning. Very few come and ask for financial planning; but once we explain about it, everyone wants it! Clients want meaningful engagements with their advisors. They are expecting more than courtesy calls, from their advisors. This is largely lost on the intermediation community which thinks that a courtesy call from time to time and a discussion on portfolio performance is more than sufficient to engage clients. Clients don’t attach much value to courtesy calls. Nor are they thrilled at portfolio performance discussions, which often adds to their stress. Anyway, advisors are expected to take care of portfolios and their returns – right? So, why make that the centre piece of the discussions. What can add meaning to clients would be special scheduled discussions about their plan, update on the happenings in their lives, changes in their personal/ professional lives, qualitative discussions about truly important things like their children, parents, their career etc. Seeking to know these would help the advisor to understand their client in a much deeper way. This will enhance the quality of advice & help in keeping the plan meaningfully updated. The clients also will truly value this as we are trying to find out/ understand all there is to know before we dole out advice. There is an even more fundamental area, where the clients can be helped. Mos of our clients go through life, without really thinking about the kind of life they would be most happy about. We all have one life and living that life to the fullest should be the motto. People get that wrong and think that aggressive financial goals is what counts for a worthy life. That’s why we see many clients leveraging themselves and buying many properties, expensive cars, bring on a lavish lifestyle, world tours etc. While these may be enjoyable & may even offer a high, they come at a price. They chain the client to keep earning at a high level. They also crowd out the truly important & valuable goals in life. We have seen cases who are stressed out & want to quit, even though they seem to be doing quite well for people from the outside. Can we advisors help there? Sure, we can. We can help them understand what is that they truly really want to do in life, what is that which will excite them, what is the quality they would want to bring to their lives which will make their lives well lived & worth looking forward to. What will give them back the wonderful feeling of freedom, the vigour, vitality & the sense of fulfillment? Once the clients understand this, it is easy to help them financially to create a life of meaning. This is Life Planning. Are clients going to ask for this? No. Is it valuable & useful to them? Absolutely yes! There are many more such services – Estate planning is an important area. If advisors are able to understand the client situation and are able to advice clients professionally here, it will be a huge help. Coaching client’s children on money matters is an important area, where we can help. Helping clients through life transitions, assisting/ advising them while their children want to go abroad for studies, assisting/ advising them on emigration to third countries etc. are things advisors can do for their clients. Clients won’t expect their advisors to do so many things for them. But, if their advisor can do all these things, they become invaluable for them. They become their CFOs, their confidants & mentors. To get there, the advisors will have to upskill themselves. But once we get here, would our remuneration be questioned? It’s a rhetorical question for which the answer is self evident. I don’t have to answer that! Ki & Ko decided to get married after a long 8 years of courtship. They had decided to respect each other’s space and individuality even after the marriage. As a part of this arrangement, they have a very one of a kind way of handling their personal finances. Their Financial Planning is quite unique. They have life goals as a family and they also have their individual financial goals. They are contributing to the common goals as well as following their respective dreams. The household expenses including the rent of the house are shared equally between the two of them. The remaining surplus is then assigned to Investment Planning towards individual and common goals. Welcome to new India. Welcome to new Independent families of young India. As financial planners, we have handled quite a few families in the age group of 35 and more which are following the societal norms of ‘One family One Plan’. They generally have family goals like child education, marriage and retirement. May be international vacation and a nice car. The couple together will work towards these goals. There will not be any goals specific to husband or wife alone. But there is a noticeable difference in the new age couples. They have individual viewpoint of their life. They will have some common goals like children education, Retirement Planning etc. They will plan parental care for their respective parents. Additionally, they may have goals like starting one’s own business, taking a sabbatical to explore the world, starting a NGO for some cause, embarking on spiritual journey to find purpose of life, etc. Financial Life planning is the solution to provide solutions to this generation. We have to blend seamlessly the togetherness with individuality. We first start with Cash flow analysis and asset -liabilities. It is followed by their income versus expenses assessment and individual networths. Budgeting of expenses for both the partners is very essential to ensure that they contribute towards day to day expenses in equal proportions. Example: If Ki is spending Rs 24000 on household expenses, Ko will take the responsibility to pay rent of Rs 23000 p.m. The next step is creation of Emergency fund. Two Separate Emergency funds for individual needs (parental care etc) and one common for household. Then Life insurances are taken after assessing the financial dependency of partner as well as their respective families. So, Ki will take Life Insurance Planning to safeguard financial liability towards Ko as well as her own parents. Same will be done by Ko. Medical Insurances are generally taken as family floater and Premium is equally shared by Ki and Ko. They will take separate policies for their respective parents and pay premium for the same.Finally, before goal-based Investment Decisions are taken, the couple’s individual risk appetite are considered as each would be investing the surpluses proportionately and the type of investments will reflect their risk profile and goal. The recommendations for their respective goals need to be given treating them as individuals. Since there are many individual goals, their prioritization becomes important from financial feasibility perspective. Lot of time is spent understanding the logic behind these goals. The scenario is changing and more and more such parallel lives enclosed in togetherness of marriage are being witnessed. We as planners have to accept this and design the plans to suit their requirements. Gold is a very favorite metal to Indians, there is a tradition also attached it, woman are very fascinated about gold jewelry normally Indians buy gold on every holy occasion. India is a 2nd largest consumer of gold in world. There is a loss in to it, as at the time of selling the jeweler reduce the weight of the ornament on the account of impurities. so if it is investment then the loss starts immediately as you buy. One of my client, who is my friend also whom I told not to buy gold more than the specified amount was approaching me in different ways to take yes from me to buy gold. It is mainly because gold had appreciated as never before to current young generation. One day he came to me with some options investing in gold which are floated by most of the jewelers around which is also very well known as Gold saving schemes or gold bhshi. What is a gold bhishi or savings plan: In this plan you have to invest some fixed amount (which normally is Rs. 1000/- and in multiple in most of the cases) every month for a specified term like 12,18,24,36 months and at the time of maturity you can buy the gold items from the maturity amount, now most of the jewelers are giving flexibility of buying Silver, Diamond, platinum or any such item if you want. The maturity cannot be cashed. These schemes are made attractive to the customer by giving discount or additional few final installments depending on the plan you select. As well as some of the jewelers gives discount in making charges of ornaments. He gets a fixed advance business because when the scheme matures client is going to buy the items from his shop only, so jeweler is assured for his future business, as well as this allows client to accumulate in small amounts the reach also increases. The small saving help you to accumulate for buying your desired item. It is like a recurring deposit which you are doing for buying gold jeweler. You can enroll in this scheme if you want to buy a jewelry to your loving ones. If you have some fixed commitment for gold items in coming 1 years or so. Define how much amount gold ornaments you want to buy and accordingly select the plan. The risk in these type of arrangement is high as compare to Bank deposits and fully depend on trustworthiness of jeweler. First you have to understand that even if it is called as gold saving plan or gold Bhaishi it is not actually you are purchasing gold during payment of installments, it is just like RD where you keep on doing installments and you will get invested amount plus interest at maturity, here jeweler gives additional installment. There are many plans which are offered to the client and are sufficient to create confusion in the mind which to select. To select which is a good plan for you let’s calculate yield from this investment. A. You pay for 12 installments + get 1 installment free and can buy the goods in 14th month. B. You pay for 24 installments + get 3 installments free and can buy the goods in 27th month. C. You pay for 36 installments + get 7 installments free and can buy the goods in 40th month. D. You pay for 12 installments + get 1 installment free and can buy the good in 13th month. E. You pay for 18 installments + get 2 installments free and can buy the good in 19th month. F. You pay for 24 installments + get 3 installments free and can buy the good in 25th month. Can you tell me which is better? Confused and most of you will either go for scheme C or F because as you go for more installments the scheme becomes more attractive by giving you more free installments. To arrive at right calculations I used internal rate of return (IRR) method and surprisingly finds following results. The returns on yearly effective basis for the schemes are as follows. This shows that the sooner is better so going for small duration schemes make sense above schemes are offered by local jeweler there is one corporate which is offering You pay for 11 installments + get 1 installment free and can buy the good in 13th month. The yield in this scheme comes to 15.93% which is better than the above schemes. Now you have offered a analysis on the schemes available, ball is in your court. For more than a decade now, we have met different types of clients; some conservative, moderate and aggressive investors. Some wish to focus on short term goals, while others have medium term and long-term goals to take care off. In this diverse group of investors, when we looked at portfolios of our newly on-boarded clients, we noticed a common trait. Investors were concerned more with their equity portfolio rather than their entire portfolio. The rationale being, “Equities are risky; it can erode capital or/and enable wealth creation. The rest of the portfolio is fairly safe, so why worry about it.” That’s reasonable justification indeed, isn’t it? This phenomenon is well explained in the Loss Aversion Theory, where for the same quantum of money, investors feel 2.5 times more psychological pain when losses are incurred compared to gains. Naive investors have designed home-made Risk management tools for this purpose. In most cases, they maintain very low allocation to equities ranging from nil to 5%. The balance portfolio is invested in safer instruments which include Fixed Deposits, Postal schemes, Insurance Policies Planning , gold, etc. This way, they ensure their downside is well protected, while expecting super normal returns from miniscule equity allocation. 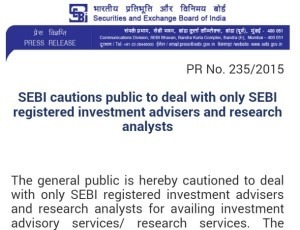 With such actions, naive investors are shouting out loud, “We need investment advisors to guide us.” Think about it, an investor is excessively obsessed with performance of only 5% of the portfolio, taking 95% of the portfolio for granted. Is this behavior rational or irrational? In such a portfolio, 95% of the portfolio will deliver approx. 7% returns, while return expectation from equities will be plus 12% to 15%. If projections meet reality such a portfolio will deliver meager 7.45% returns, which cannot beat inflation in the long term. Investors need to allocate their investments in different assets as per their goals and time horizon. For example, if they have a Financial Planning goal which is 7 to 10 years away then the allocation to that goal should be in equity as over that period, equity volatility gets moderated and returns get enhanced. For short term horizon investors should look at fixed income assets which provide safety of capital. In the endeavor to earn huge returns in short term from equities, investors may take too much risk, relying purely on luck to get the desired results. On the contrary, if investors focus on Asset Allocation whereby they invest as per their goals and risk profile from a long-term perspective, their investment journey will be way more pleasant. For example, if you have 40% equity and 60% debt, having reasonable return expectation of 15% from equities, the portfolio return is likely to be close to 12%. The major difference being, we are not betting in equities, but investing in it for the long run. Investors, stop betting on equities with miniscule portfolio allocation, it is not going to help much in the long run. Use suitable Asset Allocation, which enables you to worry lessand reap the rewards in the long run. Simply put, when the whole portfolio works hard for you, the results are likely to be better than a portfolio where only a small portion works hard. The choice is yours!!! There may be various apprehensions. Why do you become a martyr? The word “martyr” may slightly pinch you! Obligatory products mostly don’t quench your thirst for financial freedom. It’s your choice, whether or not you’ll keep away from buying obligatory financial products or services from someone. Obligatory financial products are traditionally commission based. There may be no visible upfront charges but there are hidden costs, which’s inescapable. The martyr doesn’t have knowledge about amount of commission payout. As you’re ignorant, you feel obligated to buy irrationally. When some advice is offered for “free”, you have to indirectly pay more and even the financial products become ornamental or disastrous. “Nothing is more costly than something given free of charge.” – Japanese Saying. We come across prospects/clients, who have financial plan and they may buy financial products by ignoring Financial Planning out of obligation. They’re fulfilling salesperson’s expectation and not their personal requirements/expectations. It’s their illusion as it resembles an oasis in the desert. On comprehending, it becomes too costly and can hardly offset the financial loss. Who is to blame? You being a subject, entire responsibilities are yours. You jump to solution out of obligation without understanding your exact requirements. While buying any complex financial product out of obligation/sales pitch, you don’t have answers to why you need, when you need, what you need& how much you need. You’re hypnotized by salesperson. But in short, product suitability is the ultimate diagnosis. A salesperson’s objective is to be benefitted by selling financial products only to their “customers”. While an Adviser’s objective is to be benefited by benefiting his “clients”. An Advisor is regulated by SEBI Registered Investment Advisor; where as a distributor/sales person is not subject to regulatory supervision. An Advisor is client centric because of which he’ll analyze a set of parameters before giving any advice. Your priority and expectations etc. I’m recalling a recent incident, where one of my clients mailed me that he’s approached by an Insurance Agent & he’s feeling somewhat obligated to buy a life insurance endowment policy out of sympathy. My client feels obliged on humanitarian ground and simultaneously his concern was about the product suitability. It indicated a complex behavior (humanitarian ground as well as product suitability). My responsibility was to send him an unbiased illustration. I strongly advised not to buy the insurance product after thorough analysis. His needs were not associated with the benefits of the complex financial product. My client’s emotion overweighed his rationality. It’s very difficult to manage other’s expectation unless you’re independent. An Advisor is unbiased and guides you professionally and impartially. But if you ignore his advice, hardly you can offset your financial scars. Time and money both are limited. If you lose money, either you may not get time to offset or you may not get the required money to offset the loss. A traditional life insurance may generate 5% to 6% rate of return (ROI), whereas if you invest prudently in equity & debt combination and if your investment time horizon is more than 5 years may generate much more than the Life Insurance Policy India. Moreover, you can hardly offset inflation. Still your emotions over weigh logic (rationality) . During your earning/accumulation phase and during your distribution phase (retirement/start collecting from accumulated amount), you may be approached by salesperson/ agent/ broker/ bank relationship manager etc. They will try to push their products. Without analyzing your requirement, if you buy, hardly you can get rid of the bitter consequences. To conclude, I’ll strongly recommend you to go for financial plan first, and then you follow your action plans with periodical reviews until you reach your aspirations. Your emotions are your great enemy unless you regulate them. You’re expected to face this situation multiple times in your life. Take your own decision, best suited to meet your own aspirations. It’s your choice how you live your life. In the last few months HDFC Mf has launched series of Capital protection oriented How to Invest in Mutual Funds for the investors who are not comfortable with taking risk in equity market. When anybody hears capital protection, it looks lucrative on one hand; however when you go deep into the product information the reality comes out. This category of funds are not popular in the market, reason being the performance of this category is highly disappointing. The debt portion of 83% of the invested capital will grow over the tenure of the scheme to 100% thereby protecting your capital. Rest 17% will be invested in equities which will provide upside in the portfolio. Assumed Situation over 3 years…. Source: SID of The above scheme. The above illustration clearly explains that what returns a portfolio can generate in any of the above 5 scenarios. The debt portion is clearly invested for capital protection and the equity returns generated by the scheme would depend on the portion of asset allocation of equity. The above allocation is just an example to show how this fund will work and actual allocation may be different. Should anyone invest in this scheme? As per the illustration, in case people invest in this scheme and get 0% returns on equity then the value of Rs.100 invested at the end of 3 years would be Rs.117/- Thus generating a CAGR of 5.37% only. Now if you go by the name “Capital Protection”, the scheme must generate returns equal to the inflation rate prevailing in the economy. If in a scheme if you get back less than what inflation is then you have actually lost the value of your capital. Even if you keep Rs.100 in a bank FD for 3 years at prevailing risk free interest rate of 8.5% than also you will get back Rs.127. Today minimum expectation of an investor is to get bank fd interest rate and not less than that. So its better to form your own strategy and protect your capital rather than paying high management cost to MF company and getting back minimum out of that. So to conclude, it’s better to avoid Capital Protection Funds as the features of the scheme are not very attractive and the same can be done with the help of your Investment Planning advisor or Financial Planner. Being a fresher you must be excited about your new job and carrier. You have lot of exciting dreams. You are looking for enough money so that you need not to worry while you spend. Once you have peace of mind, you can enjoy your life. You have goals and to achieve those goals you need money. Did you learn about personal finance in your school or college? If it was not in your syllabus, how will you manage your personal finance in your daily life? Personal finance deals with the process of how effectively you can manage your personal and Investment Planning assets. It deals with the income which you generate for your house hold, life style, dependent expenses, insurance premium, loan servicing, savings and investments. Try to understand about your fixed and variable expenses. Your fixed expenses are like rent, loan repayment and variable expenses are food, monthly utility bills etc. At the beginning you may have limited money but unlimited requirements and for which you must prioritize your goals. You try to differentiate needs and wants. The income we are considering your wages or salary from your job, if you have other income you can add. Let your money work for you as you work hard to earn money. If you practice to implement the following tips into your personal finance, your Financial Planning for future will be smooth. Start building a contingency fund. You keep 3-6 months’ salary in your savings bank for emergencies or unexpected expenses. The rationale is that 3-6 months may be enough time to recover from illness that you can recover, you may be temporarily unemployed for which you can make provision. Insurance. Insure yourself adequately, for life you go for term plan/pure insurance for long term. Go for mediclaim insurance plan, personal accident plan, and critical illness Insurance Planning. Although your employer may cover health insurance but still you take by your own. If you have any dependent and if they don’t have any health insurance, take health insurance for them also. Pay off your student loan. If you have student loan, repay it on priority basis. These kinds of loans shall eat up your income as the rate of interest is high. Buy low budget Car. If you need a car, buy low budget car with less maintenance cost which is good in the long run also. You have to make a big down payment and the rest in equated monthly installments. If you take loan, another debt burden will be on you and car loans are costly. Keep the EMI as low as possible. For buying a house. Buy a house/flat while your life is more stable and you have a clear vision about your future direction. You may find cheap apartment for rent and may postpone buying a house until you are financially stable. Start Retirement Plan. Although you have enough time but it’s never too early to start planning for your golden years. It’s a good habit and you enjoy the benefit of compound earnings. Since you have plenty of time it’ll not pinch your purse. Develop a Cash Budget. The objective behind of budget is to generate surplus income. A cash budget helps to control cash inflows and outflows. Its purpose is to balance your income with your expenditures and savings. I strongly recommend you to set your realistic goals and save between 30 percent and 40 percent of every rupee as soon as you join in your profession, after college. Hopefully these tips are helpful and you need clear vision, right plan and execution of plan. Disclaimer: This article is written by me and is my own original creation. If there is any claim to the contrary, I am solely responsible and I indemnify The Financial Planner’s Guild, India (FPGI) and any other publication that carries my article.